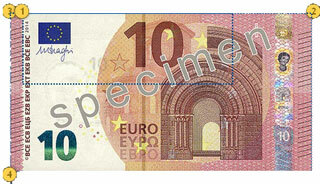 On 13 January 2014 Yves Mersch, member of the ECB’s Executive Board, unveiled the second banknote of this series- the 10 euro note. The security features of this banknote were made public several weeks earlier in online game. 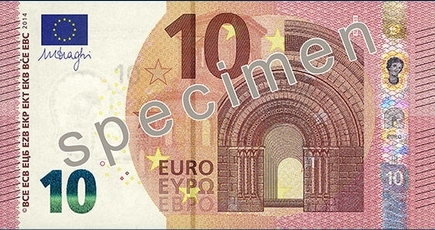 The new 10 euro will start circulating on 23 September 2014. Feel the banknote. 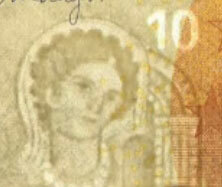 On the obverse of the note, there is a series of short raised lines on the left and right edges. To feel the raised print, run your finger over it or scratch it gently with your fingernail. 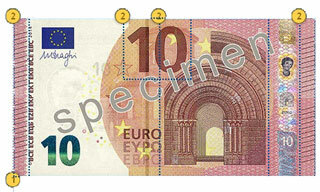 The lines make it easy to identify the banknote, for visually handicapped people. 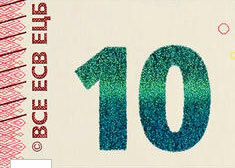 The main image, the lettering and the large value numeral on the front of the banknote also feel thicker. 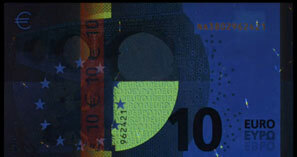 + Look at the banknote against the light. The portrait watermark and security thread become visible. The watermark is produced by varying the thickness of the paper. 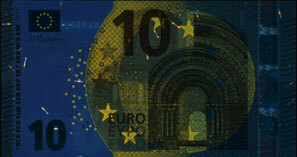 A faint image becomes visible and shows a portrait of Europa (a figure from Greek mythology), the value of the banknote and a window appears when you hold the banknote against the light. 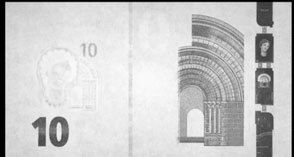 If you put the banknote on a dark surface the light areas become darker. This effect is very easy to see in the value watermark. The portrait also appears in the hologram. 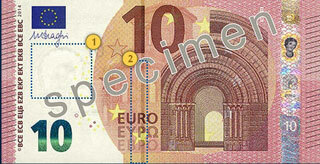 The security thread is embedded in the new 10 Euro note paper. The security thread appears as a dark stripe when you hold the banknote against the light. 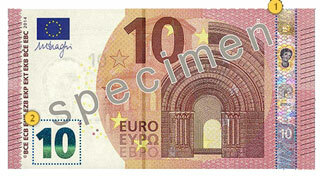 The Euro symbol and the numeral 10 can be seen in tiny white lettering in that stripe. + Tilt the banknote. The silvery stripe reveals a portrait of Europa and the emerald number displays an effect of the light that moves up and down. Tilt the banknote. 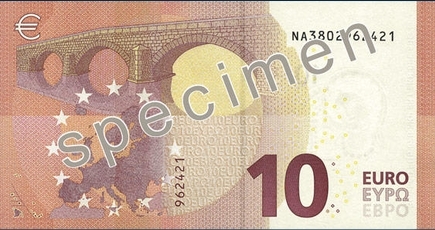 The hologram – the silvery stripe on the right of the banknote – reveals a portrait of Europa as well as the Euro symbol, a window and the numeral 10. Tilt the banknote. The shiny number in the bottom left corner of the note displays an effect of the light that moves up and down. The number also changes colour from emerald green to deep blue. Some areas of the banknote feature a series of tiny letters. You will need a magnifying glass to see it. The microprinting is sharp (not blurred). 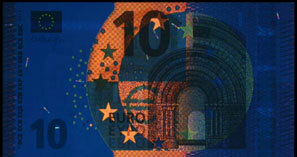 + Banknote paper absorbs the UV light. + Small fibres embedded in the paper appear. Each fibre shows three different colours- yellow, blue and red. + The stars in the EU flag, the small circles as well as the large stars glow yellow. Several other areas also glow yellow. 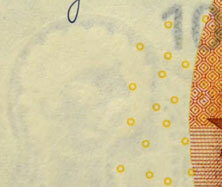 + Small fibres embedded in the banknote paper appear. Each fibre shows three different colours- yellow, blue and red. + A quarter of a circle in the centre of the banknote as well as several other areas glow green. The horizontal serial number and a stripe appear in red.